WASHINGTON – Congressional Leadership Fund (@CLFSuperPAC), the super PAC endorsed by House Republican leadership, today released a new ad, “Pennsylvania Families,” in Pennsylvania’s 1st Congressional District. 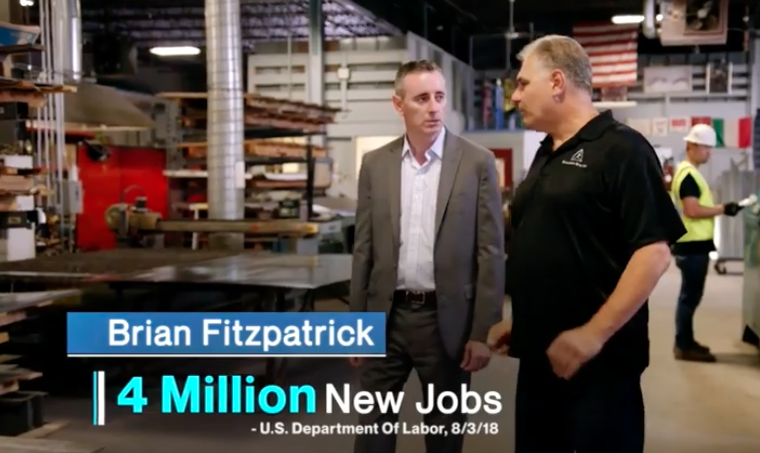 The ad contrasts Brian Fitzpatrick’s work to cut taxes for middle-class families with Scott Wallace’s radical policies that would raise income tax rates by 20 percent. The ad will run on television in the Philadelphia media market and on digital platforms throughout the district. In addition to the ad campaign, CLF previously opened a field office in Pennsylvania’s 1st Congressional District. Each CLF field office is supported by a full-time staffer and hundreds of interns and volunteers who engage with voters on a daily basis through hyper-targeted phone banking and door-to-door canvassing. Watch the ad, “Radical Policies,” here. ….or the radical policies of an angry liberal mob. …and bringing unemployment down to a fifty-year low. Scott Wallace is with them, not us.